Rudd’s return as Australian PM will make the elections more competitive, but Labor still faces a tough challenge. Kevin Rudd’s return as Australia’s prime minister has reignited an election race that had previously appeared a foregone conclusion. Political analysts that had once been questioning only the extent of the victory for Opposition leader Tony Abbott’s conservative Coalition have suddenly started asking the trillion-dollar question: can Rudd 2.0 win the unwinnable poll? 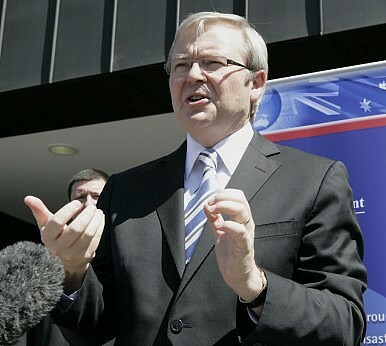 The Liberal-National Coalition were previously nearly unbackable favorites to win the September 14 poll called by Rudd’s predecessor Julia Gillard, who had seen her popularity and that of her center-left Labor party slide into dangerously low territory amid political scandals, faltering economic growth and the introduction of carbon and mining taxes. On June 26, after a phony war of botched challenges and media leaks, Rudd gained his revenge on the woman who had ended his first, tumultuous stint in office. Despite Coalition advertising reminding voters of Rudd’s previous failures, the response from the opinion polls was exactly what Labor’s strategists had hoped. For the first time in three years, the traditional party of the labor unions returned to level terms with the free market Coalition, with both locked at 50:50 each on the two-party preferred vote. And unlike Gillard, Rudd rated significantly higher as preferred prime minister than the Opposition leader. Similar to Gillard before the 2010 election, Rudd has moved swiftly to neutralize issues seen as hurting the government’s re-election prospects, including a growing influx of asylum seekers arriving via boat and the unpopular carbon tax on emissions. “Rudd’s spoken to business, environmentalists, indigenous groups – basically trying to get around as many ‘power points’ in the electorate as possible to gauge what they’re thinking, and he’s plugging holes in Gillard’s policies according to what the sectional pressure groups have told him,” Griffith University’s Paul Williams said in an interview. Rudd’s biggest economic and environmental call has been “terminating” the carbon tax which his predecessor introduced, by moving to a European-style floating price on emissions in July 2014, a year earlier than planned. While Abbott described Rudd’s move as being a “fabricator, not the terminator,” the policy change is seen preventing further Coalition attacks on the “great big tax on everything”. However, moves to help fund the A$3.8 billion budget cost by increasing taxes on employer-provided cars have sparked opposition from businesses and even other Labor leaders, with the auto industry describing it as a “greedy grab”. Noting China’s slowing growth, Bowen has spoken of the economy’s transition to more normal conditions after the cooling of the mining boom originally sparked by Chinese resources demand.